Cervical radiculopathy is characterized by pain that radiates from the neck to the arms. The pain is the result of any kind of injury or condition that aggravates a nerve – such as a pinched nerve – in the cervical spine. The important factors that suggest the need for more specific evaluation or treatment are the severity of the pain, the duration of the symptoms, and/or weakness in the neck or limbs. Some patients have both neck and arm pain related to their pinched nerves, but some only have neck pain. 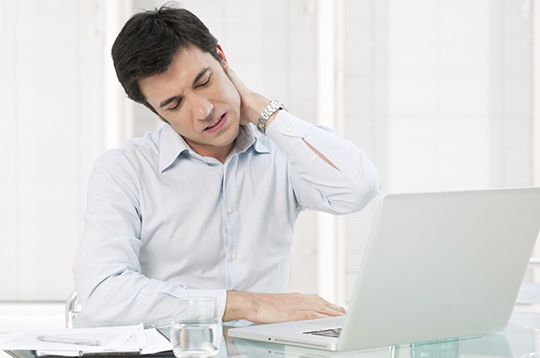 For more information, please visit our Neck and Arm Pain page. What Are the Causes of Cervical Radiculopathy? Muscle strain is a common cause of cervical radiculopathy, but it is usually temporary in nature. Cervical radiculopathy can also be caused by degenerative changes that occur as a result of aging, genetics, and wearing out of the discs. Degenerative changes can cause changes in the vertebrae as well, which often appear as bony spurs. How Is Cervical Radiculopathy Diagnosed? There are several cervical radiculopathy tests including, X-rays, computed tomography (CT or CAT) scans and MRIs to evaluate the source of problems. Nerve conduction studies, which measure nerve and muscle function. Myelograms, a test where contrast dye is injected into the sack around the spinal cord followed by imaging studies to see what areas might be causing pressure on the spinal cord or nerve roots. Discograms, in which a contrast dye is injected into the disc itself to determine whether it is herniated and to what extent the disc might be contributing to whatever symptoms are present. How Is Cervical Radiculopathy Treated? Simple, conservative interventions for cervical radiculopathy can be as basic as instruction on posture and range of motion exercises aimed at minimizing further irritation to the nerve roots and strengthening the neck. Another conservative treatment is cervical traction where the head is pulled up or pushed away from the shoulders for short periods of time each day. Additional treatments include physical therapy, activity modification, use of medications such as anti-inflammatories, pain medication, and/or muscle relaxants. More invasive treatments include epidural steroid injections (ESIs) and surgery. Surgical options include, but are not limited to, discectomy to remove a portion of a disc, or fusion, which removes a disc and replaces it with bone chips and/or metal instruments to keep the area from bending.